In classing all long-haired cats as Persians I may be wrong, but the distinctions, apparently with hardly any difference, between Angoras and Persians are of so fine a nature that I must be pardoned if I ignore the class of cat commonly called Angora, which seems gradually to have disappeared from our midst. Certainly, at our large shows there is no special classification given for Angoras, and in response to many inquiries from animal fanciers I have never been able to obtain any definite information as to the difference between a Persian and an Angora cat. 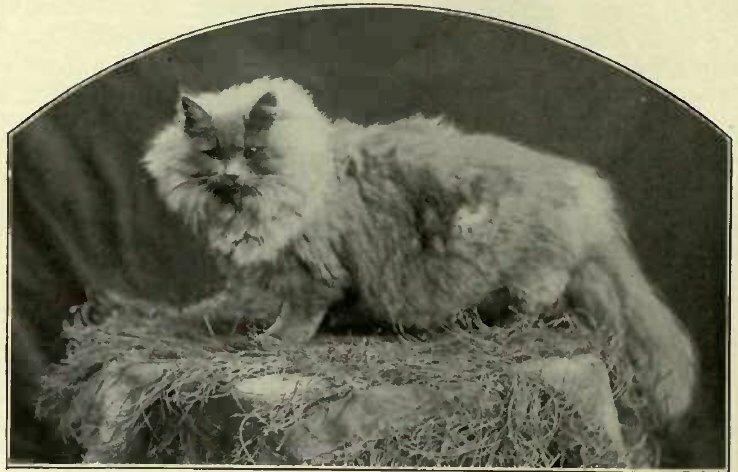 Mr. Harrison Weir, in his book on cats, states that the Angora differs somewhat from the Persian in that the head is rather smaller and ears larger, fur more silky with a tendency to woolliness. It is, however, my intention to confine my division of cats to long-haired or Persian cats, and short-haired or English and foreign cats. In both these breeds there are „self-coloured,“ „broken-coloured,“ and „any other coloured“ varieties. In the foregoing references to the diagram of the cat I have touched upon the points of the animal, which are practically the same as regards the form of body and limb in both long-and short-haired breeds of cats. It is a common belief that, in human beings, if the hair grows long and thick it is a sign of great strength and a good constitution; but as regards cats the longer the coat the weaker the animal. This I have specially noticed in Persian kittens, and have remarked that little mites with unusually long fur are the most difficult to rear, and suffer from extreme delicacy. Perhaps in-breeding amongst Persian varieties has been more carried on than with the short-haired breeds, which are allowed a greater freedom of choice, and therefore are the result of natural selection. Apart from the question of health and strength, Persian cats require a great deal more care and attention on account of the long fur. In the spring Persian cats begin to shed their coats, and this process continues through the summer months, and it is not till about October that the new fur begins to grow again. Persian cats may be considered in their finest condition during the months of December and January. It is a wise provision of Nature that during the coldest months these somewhat delicate cats should have their warmest clothing. It has often been a matter of surprise that cat shows should ever be held in the summer, when long-haired pussies present a most unkempt and moth-eaten appearance. In this condition they are not likely to win converts to the cult of the cat; but from an educational point of view these unclothed specimens give the judge an opportunity of displaying his ability, for it needs a really capable judge, with experience, knowledge, and good common-sense, to allow for absence of coat, and to place the awards accordingly. Under summer skies shape and bone will have their innings, whereas a grand winter coat may hide a multitude of sins that even the eagle eye of the most astute judge may fail to discover. 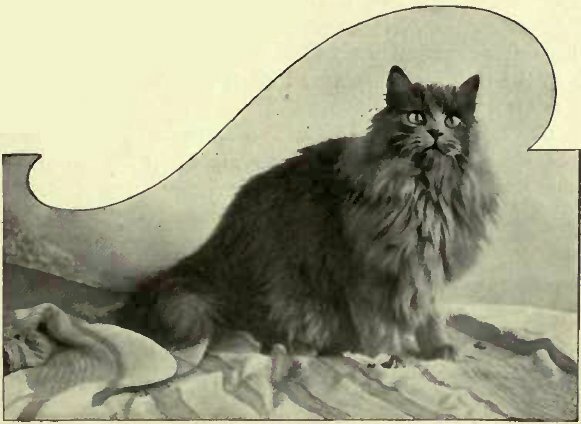 At the same time, for a breed of cats called „long-haired“ the coat ought to demand the greatest consideration; for what is the good of the most perfect shape in a Persian cat, if it is exhibited out of coat and almost like an English short-hair in a class set apart for long-haired specimens? No doubt many breeders of Persians have been led through disappointment to join the ranks of short-hair breeders, for it is indeed very vexatious and tantalising, after having entered a grand-coated cat a month before a show, to find your precious pet persistently scratching out her fluffy frill and shedding the chief glory of her breed before the eventful day when you had hoped to reap golden awards. As regards Persian kittens, the change of coat takes place between the ages of three and six months. In some cases long-haired kittens will -cast their fur to such an extent as to present the appearance of an uneven short-haired specimen, whereas in others the shedding process is so gradual that the transition stage from a kitten to a cat is hardly more discernible in the long- than in the short-haired breeds. Any severe illness may cause the fur to come out of Persian cats at any season of the year, and the growth of the new coat will be retarded by poor condition of the skin. In both long- and short-haired cats, as in other animals, the teeth are the chief guide in deciding the age, and a kitten may be said to become a cat after six months, when the adult dental process is completed, and the second set of teeth has become established. And here I would quote from Mr. John Jennings‘ interesting book on „Domestic or Fancy Cats“ in support of. my twofold classification: „Of the many varieties or breeds of the cat with which we are now familiar, it must be remembered that, however crossed, selected, re-crossed, domesticated, or what not, we have but two breeds on which the superstructure of what is known to-day as the ‚classification of varieties‘ has been reared – viz. the long-hair or Eastern cat, and the short-hair or European. The term ‚breed‘ is even here used advisedly, for whatever the outer covering or coat, colour, or length of fur, the contour of each and all is practically the same. At the present time there is no doubt that long-haired cats are the more popular, and, judging by the entries at our large shows, the numbers may be taken as four to one. A slight reaction has set in since short-haired societies have been formed, but the fascination for fluffy pets and pretty pussies will, I think, always predominate, for the less attractive points of the English domestic cat do not appeal so strongly to the heart and the eye of the general public. 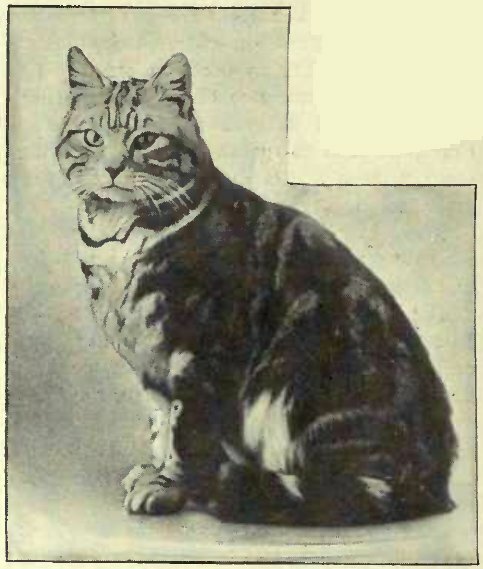 It may be remarked by the readers of „The Book of the Cat“ that very few pictures of short-haired cats are reproduced; and it is just because the long-haired pussies are so much more attractive that they are brought into greater prominence in this work. It is more difficult to obtain nice photographs of short-haired cats, probably because the owners of these less expensive pets do not think it is worth while to spend their money or to go to any trouble over having a good picture taken. As regards the coloured plates appearing in this work, care has been taken to instruct the artists to bring out as prominently as possible the special points of the cats, long- and short-haired. It is the first time that coloured plates of the different kinds of cats have been attempted; and it is hoped that, as types of each breed, these will prove useful to fanciers and instructive to the cat-loving public.